1. Honor Your Hunger – Keep your body biologically fed with adequate energy and carbohydrates. When we skip meals or limit our calories, we set ourselves up for overeating or eating faster at the next meal. 2. Honor Your Feelings Without Using Food – Find ways to comfort , nurture, distract, and resolve your issues without using food. Anxiety, loneliness, boredom, anger are emotions we all experience throughout life. Each has its own trigger, and each has its own appeasement. Food won’t fix any of these feelings. 3. There Are No ‘Good’ and ‘Bad’ Foods – Putting certain foods on a pedestal while demonizing others leads to binging, backlash eating, over-restriction, and of course, a whole heck of a lot of shame and guilt. Certain foods are more nutritious than others. That doesn’t mean those foods are better than foods that are less nutritious – they simply have more nutrients and serve a different purpose. 4. Repeat …There Are No ‘Good’ and ‘Bad’ Foods! While a snack with lots of added sugar might not provide many nutrients, it does provide an easily available source of energy if I decide to go on a run or hike later on. Even if you’re looking at food from a purely nutrition standpoint, it isn’t so black and white. Ice cream provides calcium and fat soluble vitamins. Pasta provides your brain with the carbohydrates it absolutely needs. Heck, even soda contains fluids to help keep you hydrated! 5. Exercise – Feel the Difference – Forget militant exercise. Just get active and feel the difference. Shift your focus to how it feels to move your body, rather than the calorie burning effect of exercise. If you focus on how you feel from working out, such as energized, it can make the difference between rolling out of bed for a brisk morning walk or hitting the snooze alarm. 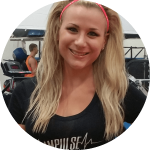 Interested in learning more weight loss tips from Courtney? Contact her at [email protected] for more information. You could begin losing weight and feeling healthier TODAY: why wait? !